Bell China & Grainger & Co Query:- Hi, I recently saved a couple of pretty things from being sent to the boot sale following a clear out. I have part of a china tea set and a small jug which I hope you might be able to enlighten me about. 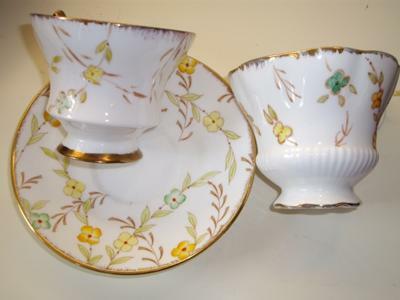 The teaset is by Bell China - it has the 1936-1966 mark on the bottom of the plates and saucers. However, the teacups - there are 4 of one design and two larger of a slightly different design - are a little strange. 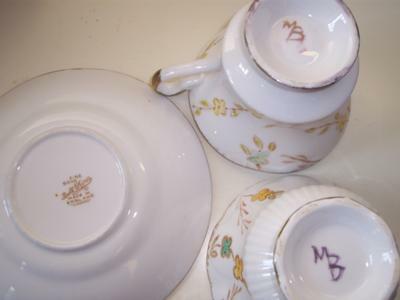 They are slightly different from the saucers and plates in that they appear more crudely painted and they have the initials MB hand painted on the base. In your opinion, do you think that they would have originally been from different sets? I'm assuming the hexagonal cups were bought to replace broken cups, but I'd like to know if the MB cups would have been part of the original set. And is there any way I could find out who MB is? on the base. The jug is sweet,about 10 cm high, but isn't very fine. It is glazed in white with blue and gold painted decoration in a neo-classical design. There is a bulbous ridge (quite uniform) on either side of the jug where it appears that is hasn't been very well finished off after slip-casting. I know that Grainger finished production in the early 1900s, but the mark looks quite modern. And the quality is odd too - I understood that Grainger made fine porcelain. 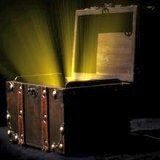 Could you throw any light on the subject for me please? 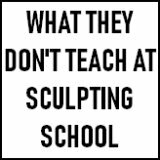 Interesting queries. 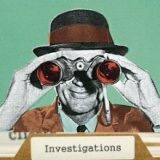 You have obviously done quite a bit of researching already, and know your stuff, so hopefully I can just add some thoughts which might help. Also, hopefully, other knowledgeable contributors might be able to help with this one too (check out the comments section below for replies). I believe what happened with your part set is that at some time in the past, some cups needed replacing, so the owners got hold of some whiteware and either commissioned an artist (MB) to paint on the pattern, or they were MB themselves. 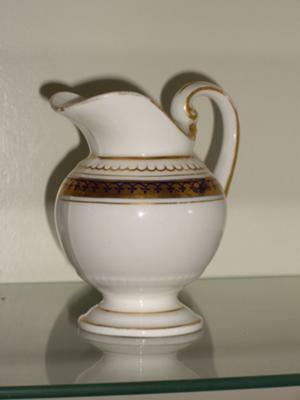 With regards to your Grainger jug or pitcher, this type of ware would not be inconsistent with Granger & Co semi-porcelain ware which was introduced after 1848. Items marked with the words "Grainger & Co Manufacturers Worcester" are consistent with a period of markings according to Goddens Encyclopedia between 1850 - 75. In 1889, Royal Worcester bought Grainger and in 1902 The Grainger works closed and the workforce moved to Worcester. GEORGES GRAINGER (& Co) : Worcester, c. 1839-1902, porcelain, parian, semi-porcelain, formerly Grainger, Lee & Co (1812-39). Semi-porcelain would be at the bottom end of values, whilst hand painted jugs would be at the higher end. For example, you can see a hand-painted jug which fetched £1000 GBP at http://www.morphets.co.uk. Again, use their search facility to find Grainger lots. (Ref: Sandon, Henry and John: Graingers Worcester Porcelain, plate 81 page 97) book included. See illustration. ... and also at www.delomosne.co.uk a "pair of Grainger's Worcester jugs with coursing scenes. 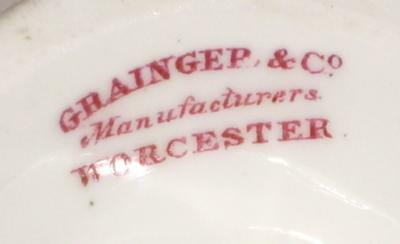 Script mark in red, 'Grainger & Co, Worcester'. c.1820. £1,250"